Beyond the Mexican Mural utilizes Los Angeles Resources as Mural Capital of the World. 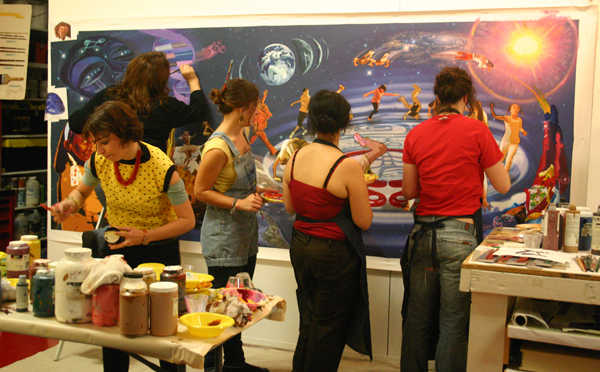 This Course is A Studio Class, intended to explore Muralism as a method of community education, development and empowerment. 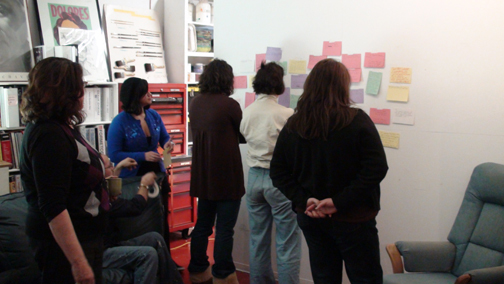 Issues are explored through the development of a large scale collaborative painting for placement in a community. 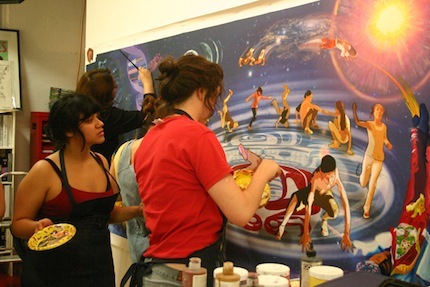 This course is taught in a community setting at the SOCIAL AND PUBLIC ART RESOURCE CENTER’S (SPARC) mural studios in Venice California. 10 Minutes from campus. Students will be researching, designing, working with community participants, and installing permanent mural which will be placed on the University Elementary school site. The Exercise: the intention of the exercise is to take a group of strangers and facilitate sharing of personal histories, move into affinity groups of common experience and create an artistic representation of the commonly held experience. Students wrote 10 moments of epiphany as part of the Shared Experience exercise. The Students formed groups which then created presentations that interpreted their collective experiences. On Thursday, January 15, Students in the Beyond the Mexican Mural course visited the UCLA University Elementary School at the invitation of the school as part of research for an on-site mural. The 25 ft mural will be featured at the heart of the school and will focus in on 6th grade students’ hip hop dance class as a theme. 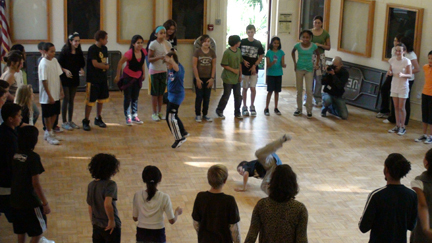 UES 6th graders performed their hip hop dance routines during the DML students’ visit to the site. The students performed in a cypher, the circular formation that surrounds performers and battlers. 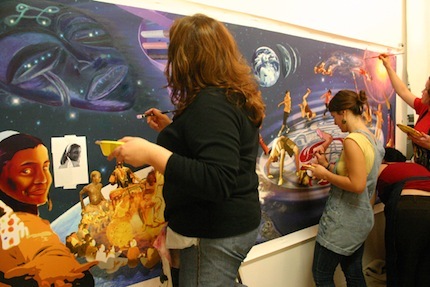 Judy Baca’s Beyond the Mexican Mural Class was recently asked to paint a mural for the 6th graders of UES. We were invited to their hop-hop dance class to find inspiration for what we would fill the nine by twenty-five-foot space with. 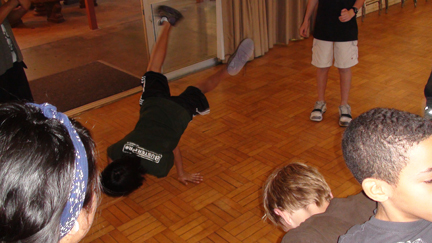 There, we were impressed (though not surprised) by the 6th graders’ skills and enthusiasm and drawn to the level of communication that occurred through the movement of their bodies. Dance occurred mainly in a “cipher” (the circular formation of artists that hip-hop dancers or rappers freestyle within). Because of this, our mural operates on themes stemming from circles, ellipses and ciphers. The cycle of water – water that flows through the rivers, evaporates into the air, and then falls to the earth once again – gives birth to humanity and all living things on the planet. Time and life enable the emergence of the languages, cultures, beliefs and values that form histories. These histories make us who we are and influence the evolution of humanity. We hope to engage the participants and viewers with our painted mural just as much as the 6th graders’ engaged us with their dancing. Most importantly, we want the UES students to connect to the piece, to really feel that it is theirs. 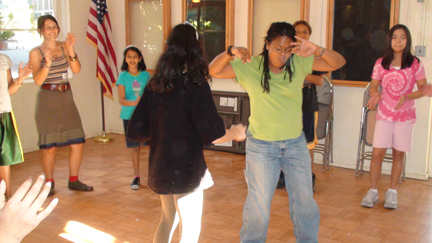 To do this, we will use images (captured through both still photography and video) of the 6th graders to illustrate the way that dance is a means of expressing both microcosm and macrocosm, both personal and universal experience. On the left side of the mural we see earth. On this earth burns a fire. Around this fire stands a dance cipher (circle). Members of the cipher include both ancestral and contemporary figures, though all are based on the photographic images of the UES 6th graders. In the left corner of the cipher, a dancer invites the viewer into the circle by extending out his hand. From the fire around which the dancers form their circle emerges smoke. This smoke billows into the heavens, depicted on the right side of the mural. The smoke transforms into DNA strands as they extend into the universe. Now in space, the viewer can make out the Milky Way Galaxy in the distance. From the Galaxy flies a Papantla, a Mesoamerican dancer. Near him is a drum that has the appearance of a spaceship, as fire extends from its rear, propelling it forward. Contemporary dancers orbit around the scene.